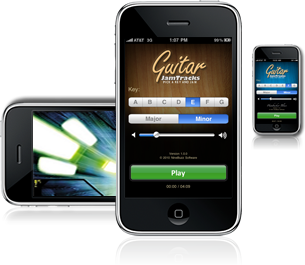 Practice jamming, learning the Pentatonic scale and soloing to 5 great sounding jam tracks right from your iPhone/iPad! Our easy-to-read scale charts show you exactly where to put your fingers to start sounding like a pro. 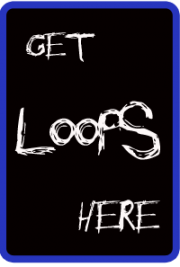 See for yourself why thousands of guitarists love our jam track apps! Learn the chord progression for each track, and then jump over to practicing scales. Guess what? There are only 5 ‘shapes’ of the pentatonic scale to memorize! Once you know them up and down, learn where they start for each key. Soon, you’ll be able to solo over 99% of the music out there! Gain more versatility by playing in different modes (major/minor/blues major/blues minor) too. – Black dots are regular notes. – Red dots are ‘root notes’. These are notes of the key you are in. – Blue dots are ‘passing notes’. Including these notes puts you in a Blues mode. Major and Minor Pentatonic scale charts are included for every key. We show you where to put your fingers – just start playing a track, load up the scales and go! You’re instantly jamming with the band. Every track has a listing of chords that are used in the track, along with scale charts – practice rhythm or lead with ease! You will get hours and hours of use out of this little app. 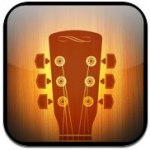 Practicing guitar shouldn’t be boring – download this app today and make practice fun! Practicing your scales is the best way to get comfortable with the fretboard. Once your learn the 5 different shapes of the pentatonic scale in every key, you’ll be able to play along and solo to nearly any song! Don’t fear the fretboard — conquer it one scale at a time with Guitar Jam Tracks!